Camarones Fritos Con Crema de Chipotle | Mexican Appetizers and More! Camarones Fritos con Crema de Chipotle (Fried Shrimp with Creamy Chipotle Sauce) is a truly perfect appetizer anytime! 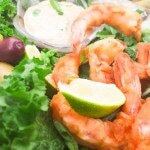 Marinated shrimp, then fried and served with a creamy chipotle sauce. I post many seafood recipes all the time, sometimes I wonder how I keep my non seafood followers interested in reading this here little blog of mine 🙂 …because I have much more seafood posts than I do anything else! I just love seafood my foodie friend! I try to diversify my recipes and my posts, but truthfully, sometimes, it is somewhat hard for me…. Camarones Fritos con Crema de Chipotle! Or Fried Shrimps with Creamy Chipotle Sauce! Let’s continue talking about this very simple but absolutely delicious Camarones Fritos con Crema de Chipotle recipe. As I said before, I make a lot of seafood recipes and quite a few are shrimp recipes so a bag of frozen shrimp are usually in my freezer at all times. However, not to long ago I came across shrimps from Argentina. I buy these shrimps at one of my local markets that sells foods from different places around the world, and lucky for me, they always have these Argentinian Shrimp that I swear to you taste like lobster! They are my ultimate favorite shrimp to buy! I have written about these delicious shrimp in past posts and have said that if you are lucky enough to live in a place where Argentinian shrimp are sold, PLEASE OH PLEASEEE buy these!!! I promise you won’t regret it! They’re just fabulousssssss! 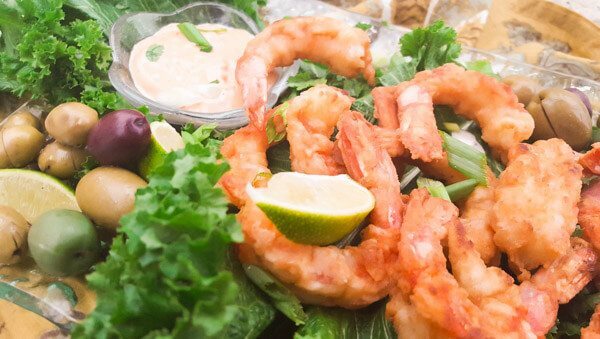 But no worries, you can use any fresh or frozen raw shrimps for this recipe. To truly enjoy fried shrimp, you must have an amazing sauce to go along with it. And this Creamy Chipotle Sauce is no exception. A creamy chipotle sauce is very simple to make and it does wonders for any fried shrimp recipe. Combine a few ingredients and you would have created the perfect sauce/dip for your fried shrimp. Ingredients: chipotle peppers in adobo sauce, mayo, fresh garlic, fresh lime juice, salt and pepper. Simple right? Make this delicious sauce and a whole magical thing happens when you use it as a dip for your fried shrimp. For another variation on another delicious creamy chipotle sauce, check out Laylita’s version from Laylita.com. Take mayonnaise, chipotles and lemon juice and place in a chopper or blender. Pulse until well combined and chipotles are well chopped into mayonnaise. Set aside or cover and put in the refrigerator if it will be a while until you fry shrimp. Peel and devein shrimp. You can choose to keep tails on. Marinate in a bowl with salt, pepper, chopped garlic and lemon juice for 30 minutes. In a frying pan or skillet heat about a 1/2 inch of oil over medium heat. Fry shrimp in batches on both sides until golden brown. Drain on paper towels. Sprinkle with lemon or lime juice and serve shrimps immediately with the Creamy Chipotle Sauce. Enjoy!